Bollinger, C.J. (1952). A 44.77 year Jupiter-Earth-Venus configuration Sun-tide period in solar-climate cycles. Academy of Science for 1952 – Proceedings of the Oklahoma 307-311.
who illustrated the ~22 year JEV cycle over 60 years ago — see the configurations illustrated in Table 1 on p.308. The dominant planetary gravitational force acting upon the outer convective layer of the Sun is that produced by Jupiter. Other than Jupiter, the two planets that apply the greatest tidal forces upon the outer convective layer of the Sun are Venus and the Earth. Periodic alignments of Venus and the Earth, on the same or opposite sides of the Sun once every 0.7997 sidereal Earth years, produces temporary tidal bulges on opposite sides of the Sun's surface layers (red ellipse in the schematic diagram above). Whenever these temporary tidal-bulges occur, Jupiter’s gravitational force tugs upon these tidally-induced asymmetries and either slows down or speed-up the rotation rate of plasma near the base of the convective layers of the Sun. It is proposed that it is the resultant variations in the rotation rate of the Sun’s lower convective layer, produced by the planetary tidal torquing of Venus, the Earth and Jupiter, that modulate the Babcock-Leighton solar dynamo. Hence, we claim that it is this modulation mechanism that is responsible for the observed long-term changes in the overall level of solar activity. In addition, this mechanism may be responsible for the torsional oscillations that are observed in the Sun's convective layer, as well. It naturally produces a net increase in the rate of rotation of the outer layers of the Sun that lasts for 11.07 years (i.e. equivalent to the Schwabe cycle), followed by a net decrease in the rate of rotation of the outer layers of the Sun, also lasting 11.07 years , . Hence, the net torque of Jupiter acting on the V-E tidal bulge has a natural 22.14 year periodicity that closely matches the 22 year Hale (magnetic) cycle of solar activity , , . The equatorial convective layers of the Sun are sped-up during ODD numbered solar cycles and slowed-down during EVEN numbered solar cycles . This provides a logical explanation for the Gnevyshev−Ohl (G−O) Rule for the Sun . This model naturally produces systematic changes in the rotation rate of the outer layers of the Sun that result in an apparent synchronization with the Bary-centric motion of the Sun about the centre-of-mass of the Solar System, as observed by Wilson et al. (2008) . In all but two cases between 1750 and 2030, the time for solar minimum is tightly synchronized with the times where the Jupiter's net torque (acting on the V-E tidal bulge) is zero (i.e. it changes direction with respect the Sun's rotation axis) , . If you consider the torque of Jupiter upon the V-E tidal bulge at each inferior and superior conjunction of Venus and Earth (rather than their consecutive sum = net torque), the actual magnitude of Jupiter's torque is greatest at the times that are at or near solar minimum. Even though Jupiter's torque are a maximum at these times, the consecutive torques at the inferior and superior conjunctions of Venus and the Earth almost exactly cancel each other out. Remarkably, if the first minimum of Solar Cycle 25 occurs in 2021 ± 2 years, it will indicate a re-synchronization of the solar minima with a VEJ cycle length of 11.07 +/- 0.05 years over a 410 year period . On these two occasions where the synchronization was disrupted (i.e. minima prior to the onset of cycle 4 (1784.7) and Cycle 23 (1996.5), the timing of the sunspot minimum quickly re-synchronizes with the timing of the minimum change in Jupiter's tangential force acting upon Venus-Earth tidal bulge . If the time frame is extended back to 1610, then the four occasions where the synchronization is significantly disrupted closely correspond to the four major changes in the level of solar activity over the last 410 years i.e. the minima prior to the onset of cycle -11 (1618/19), marking the start of the Maunder Minimum, the minimum prior to cycle -4 (1698), marking the end of the Maunder Minimum or the restart of the solar sunspot cycle after a 60 year hiatus, the minimum prior to cycle 4 (1784.7), marking the onset of the Dalton Minimum and minimum prior to cycle 23 (1996.5), marking the onset of the upcoming Landscheidt Minimum . The main factors that influence the level of tidal torquing of Jupiter, Venus and the Earth upon the outer layers of the Sun are the 3.3 degree tilt in the heliocentric latitude of Venus' orbit and the mean distance of Jupiter from the Sun. At times when the tidal torquing of Jupiter, Venus and the Earth reach its 11 year maximum, the long-term tidal-torquing is weakest when Venus is at its greatest positive (most northerly) heliocentric latitude and Jupiter is at its greatest distance from the Sun (≈ 5.44 A.U) . Since 1000 A.D., every time the long-term peak planetary tidal torquing forces are at their weakest there has been a period of low solar activity know as a Grand Solar minimum . The one exception to this rule, was a period of weak planetary tidal peaks centered on 1150 A.D. that spanned the first half of the Medieval Maximum from 1090−1180 A.D. The reason for this discrepancy is unknown, although it could be explained if there was another countervailing factor present during this period that was working against the planetary tidal effects . The VEJ Tidal-Torquing Model has natural periodicities that match the ~ 90 year Gleissberg Cycle, the ~ 208 year de Vries Cycle, and the ~ 2300 Hallstatt Cycle . Ian R. G. Wilson, Do Periodic Peaks in the Planetary Tidal Forces Acting Upon the Sun Influence the Sunspot Cycle? The General Science Journal, 2010. Publications of the Astronomical Society of Australia, 2008, 25, 85 – 93. 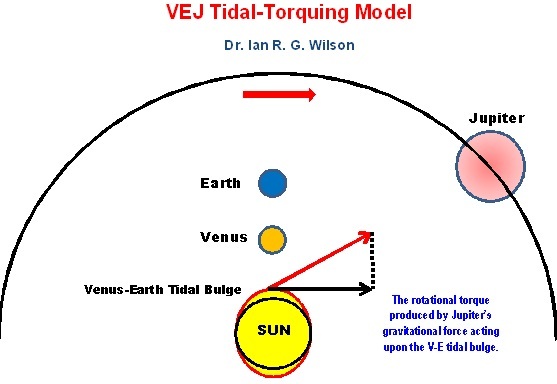 Why the VEJ Tidal-Torquing Model? Set out below is a general description of the evolution of my ideas on the topic of planetary motion and Solar activity over the last eight years. Note: If you are kind enough to read the following in full you, might want to do so in light of the fact that at every revelation, twist and turn along my journey of discovery, I found that there were others before me who had independently come to the same or similar realizations and/or conclusions. In 2005-6, when I first started this research, I believed that solar activity was (somehow) being modulated/influenced by the Sun’s SIM (i.e. Barycentric) motion. Since, the Sun’s Barycentric motion is primary controlled by the Jovian planets (dominated by Jupiter and Saturn), I argued that there was a link between the orbital motion of the Sun about the Barycentre (represented by the moment-arm of Jupiter upon the Sun as it moved about the Barycentre) and the rotation rate of the outer layers of the Sun. We called this link a SPIN-ORBIT COUPLING because it appeared that the rotation rate of the surface layers of the Sun [i.e. the SPIN] was linked the orbital motion of the Sun about the Barycentre [i.e the ORBIT]. Unfortunately we could not provide a valid physical mechanism to explain this link. All we had was an observational link [see figure 8 of the paper cited directly below] however this was strong enough for our paper to get through peer-review, after a messy two year battle with the editors of three different journals. Wilson, I.R.G., Carter, B.D., and Waite, I.A., Does a Spin-Orbit Coupling Between the Sun and the Jovian Planets Govern the Solar Cycle?, Publications of the Astronomical Society of Australia, 2008, 25, 85 – 93. It soon became apparent to me (around 2008) that there was no viable physical mechanism to directly link SIM with changes in the level of solar activity. Einsteins Principle of Equivalence had to be violated if there was such a connection. However, I still firmly believed that there must be a connection between the motion of the planets and the level of solar activity. This meant that it must have something to do with the planetary tides – even if their weakness made them an unlikely candidate. This created a dilemma. The strongest planetary tides acting upon the Sun were those of Jupiter, Venus and the Earth, while the dominant direct gravitational influence on the Sun’s SIM was that produced by Jupiter and Saturn. Given that I knew that there was an observation link between the rotation rate of the surface layers of the Sun and the SIM of the Sun, and the fact that I believed that it was the changes in solar rotation that were moderating the level of solar activity – I could come to only one conclusion. The tidal forces of the planets [i.e. Jupiter, Venus, and/or Earth] which were most likely responsible for the changes in the Sun’s rotation rate via tidal torquing had to be somehow linked with the gravitational forces that were producing the Sun’s SIM [i.e. Jupiter and Saturn]. Although I did not fully appreciate the role that tidal-torquing played in this model, preferring to believe that it was peaks in the strength of the planetary tides caused by alignments between Jupiter, Venus and the Earth that were responsible for modulating solar activity. Some time in 2011, I finally realized that in order to produce large enough changes in the rotation rate of the outer (equatorial) layers of the Sun, you need to have the strongest gravitational force acting upon the Sun [i.e. Jupiter] acting upon the biggest possible tidal bulge that could be produced by the remaining planets [i.e. alignments of Venus and the Earth]. This slowing down and speeding up of the outer layers of the Sun could only be accomplished by a TIDAL-TORQUING mechanism similar to the mechanism by which the Moon slowed down the Earth’s Rotation through its GRAVITATIONAL action upon the Earth’s oceans via the TIDAL BULGES. However, in the case of the Sun, Jupiter provides the GRAVITATIONAL FORCE that slows and speeds up the Sun’s rotation rate, while alignments of VENUS and EARTH produced the tidal bulges. So, from about 2008, on-wards, I have been arguing that the connection between SIM and solar activity is an ILLUSION. It wasn’t until 2011, that I finally realized that this ILLUSION was created by the logic train cited directly above. Hence, it is important that a context or model is developed to show how the gravitational and tidal forces of planets act upon the Sun to influence the general level of solar activity.